“With its deliberate mixing of numbers and letters, From One to Z is, by implication, about the vast panoply of human knowledge. 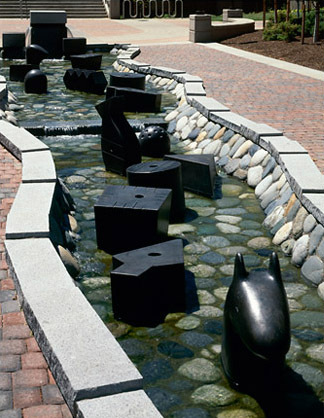 Appropriately located in front of the new JFK Library at Eastern Washington University, the 70-foot meandering stream spatially defines a plaza, a mall, and their connections to the rest of the campus. Bornstein, once again chose to reveal the hidden history, geology, and geography of a place. Working from a terrain dotted with basalt boulders, or glacial erratics, formed some 16,000 years ago by the catastrophic Spokane flood, she made a waterway evoking this geological history. 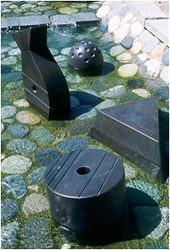 The stepping stones are bronze “tokens”, modeled after tiny clay Sumerian forms dating from 8,000-3,000 B.C. Long dismissed as inconsequential, these tokens have recently been found to mark the common origins of abstract counting and writing. (The fact that this monumental discovery was made by a woman scholar-Denise Schmandt-Besserat…was also appealing.) In their compression of knowledge, the tokens were the computer chips of their day”. “I find it remarkable that these once discarded artifacts illustrate the dynamic interconnection between, technology, cognitive skills, economy, mathematics, communication and social structure in prehistory. They illustrate the development of sculpture and picturemaking as part of the public process”.